It might be the end of November in Arizona, but I’m finding myself swimming in zucchini lately. I’ll admit.. I always find myself overwhelmed when I have too much.. but am quick to remind myself that zucchini really does make great homemade Christmas gifts for neighbors, family and friends – especially if they love a good polish sausage or hot dog, or hamburger on the grill. Really though – who doesn’t love to fire up the grill? Here in Arizona we can do that all year long .. so it only makes sense to make more relish. A few weeks ago, we had over 10 huge zucchini and processed ten jars of relish – at some point, I will need a dedicated refrigerator just for my fermented and canned items because I truly am running out of room. This recipe for relish is that recipe I rely on every year to pump out the same beautiful jar after jar – we process in a water bath when we are done and it keeps in a cool, dark pantry for up to a year. Though if you give as gifts, you shouldn’t need to worry about that because one jar can be used up reliatlvey quickly. 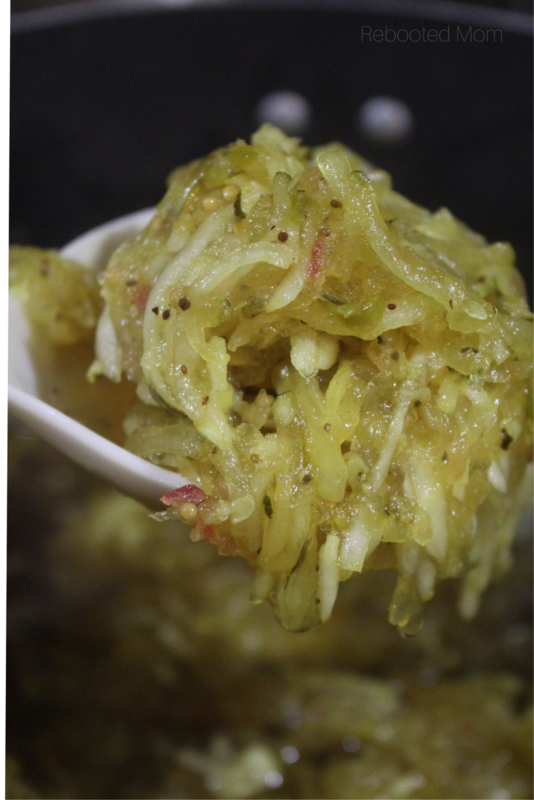 We have made this relish with as little as 2 large zucchini, and as many as 7 large zucchini. Making it with 2 large zucchini gave us 2 pints, whereas 7 large zucchini gave us 6 pints. So it’s safe to say that each large zucchini will give you a pint (more or less). We pulled off some red and green bell peppers from our garden, and shredded in the food processor – I love the color it gives the relish. 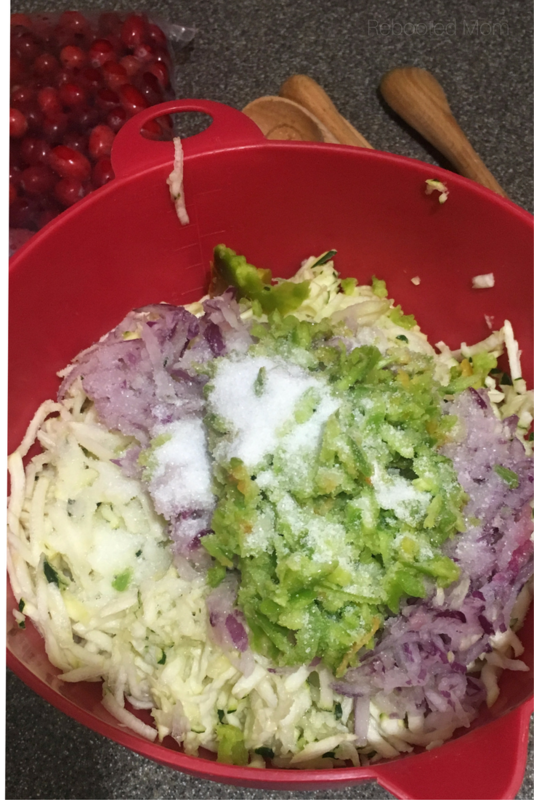 Instead of using a white onion, we used a large purple, which gave us some more zest and some added color to the finished relish. All in all this recipe is incredibly easy to throw together – the hardest part might be soaking the zucchini in salt overnight! *Add some zest to this relish by tossing in two jalapeños – remove the stem and seeds and finely dice before adding to the zucchini mixture on the stovetop. *Feel free to use apple cider vinegar in lieu of the regular distilled vinegar – it will turn out just as incredible. *The sugar is what gives this relish the acidity it needs to stay safe in a cool, dark, pantry for up to 12 months. 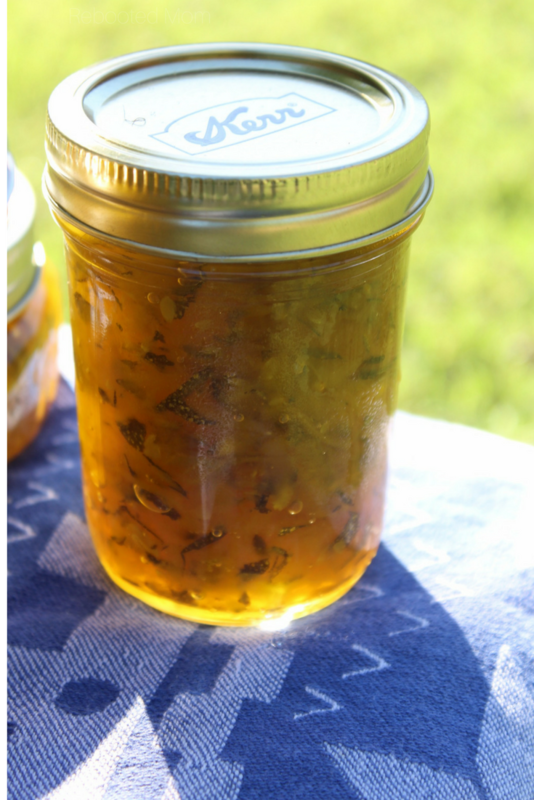 If you reduce the sugar, then consider storing your jarred relish in the freezer. *We have always used our relish within 7-8 months, but it can safely be kept in a cool dark pantry for up to a year (provided you don’t alter the sugar content). If you don’t feel comfortable storing this in your pantry (unopened of course), it freezes beautifully too. 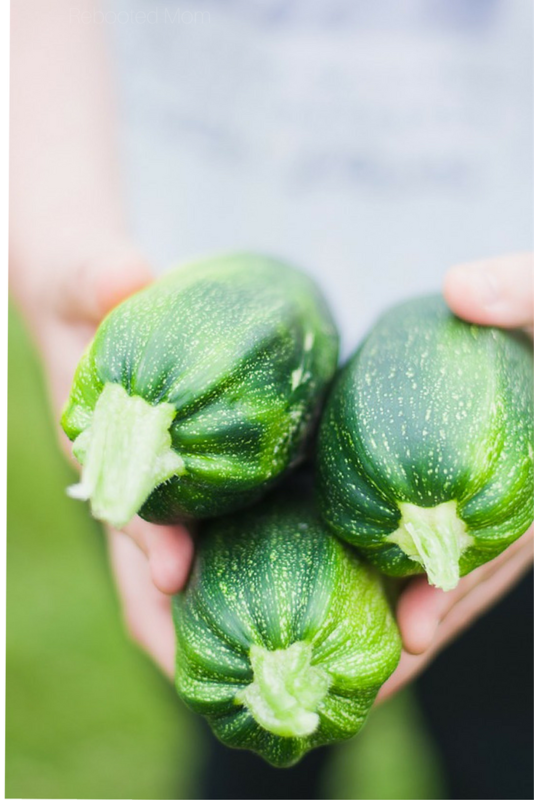 The BEST recipe for sweet zucchini relish and a great way to us up an abundance of zucchini from the garden! This relish is delicious on hamburgers, brats and even baked potatoes! Cut stems off the bell peppers, and slice the ends off the onions and zucchini. Put the zucchini, onions, and bell peppers through the food processor. Dump them in a non-metallic bowl and pour the salt over the top. Use your hands to mix the salt in evenly. Cover the mixture with saran wrap and refrigerate overnight. The next day, drain the mixture in a colander - rinse with water, squeeze excess, rinse again, and squeeze out the excess. Combine the sugar, vinegar, mustard seeds, turmeric, black pepper, celery seed and nutmeg in a medium stockpot. Mix well until sugar is dissolved, then bring to a boil. Immediately reduce the heat to low/medium and simmer 4-5 minutes. Add the zucchini/onion/pepper mixture to the stockpot, stir to distribute spices/vinegar evenly. Bring to a boil, then immediately reduce the heat to low/medium and simmer 25-30 minutes. In the meantime, sterilize 6 pint canning jars and lids in your water bath canner. Remove and set aside. Ensure the water bath canner is filled at least half way with water to process the jars once filled. Ladle the relish into your jars, leaving 1/2 inch of head space. Screw the lids and bands on tightly, and rinse the jars under the faucet to remove any relish residue. Place the jars in the water bath canner - ensure they are not touching, and that they have at least 2 inches of water covering the tops of the jars. Bring your water bath canner to a full boil, then cover and process for 30 minutes. Carefully remove the jars, place on a cloth covered counter top until cool 24 hours. Push on the top of each jar lid to ensure a tight seal. The lid shouldn't move up and down (if it does, you may need to re-process longer in the water bath). Jars can be stored in a cool, dark pantry for up to 8 months. Once opened, refrigerate and use within 2 weeks. Add some zest to this recipe by tossing in 2 sliced jalapeños! This relish makes a wonderful Christmas gift or gift for a new neighbor, as does our Homemade Dill Relish. What’s your favorite way to use an abundance of zucchini? 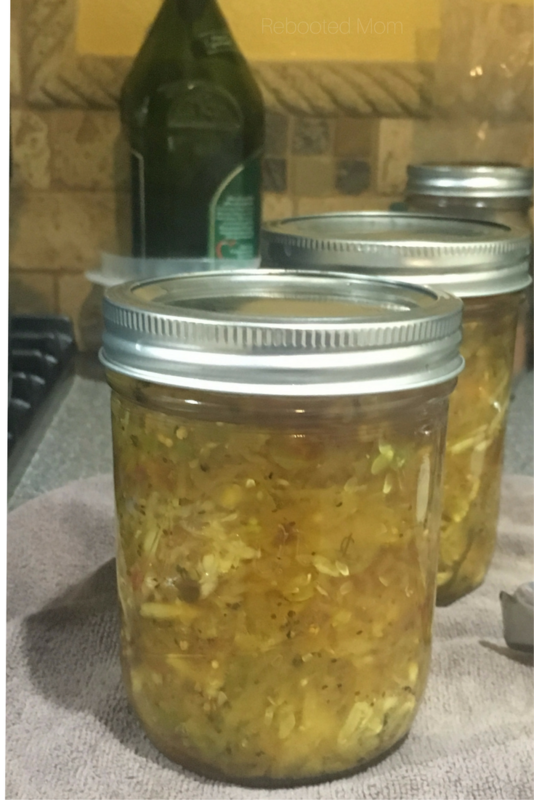 Share the post "Sweet Zucchini Relish"